Thought I would share affordable ways of creating a website/blog for your soccer team. There are various packaged websites or blogs available on the market. For $50/month you will get a professional designed website and have an entire control on what gets published. I recently created www.soccerwires.com for only $50/month using Web Design Express. products/services where prospective clients can browse through your offerings. I suggest that you follow my recommendations to successfully create a website/blog for your business. I paid less than $10 to register the domain www.soccerwires.com, which is renewable annually. Say for an example your company name is Midway General Dealers, going for www.midwaygeneraldealers.com might be a bad idea (it’s too long), as opposed to registering www.midway.com or www.mgd.com (provided those are still available). The shorter a domain the better for people visiting your website to easily remember it. A website can only go live (be accessible to the rest of the world wide web) through a hosting account. This works the same way as fuel for your car, without it your car cannot move. Many hosts try to trick new customers into buying expensive packages, when it really doesn’t need to be pricey at all. I recommend using HostGator, where you’ll pay less than $10 per month. Too good a deal compared to local service providers. – Hire a professional web developer and pay thousands of rands. – Buy a packaged wordpress theme at a fraction of the price, you would have been charged by a professional designer. I recommend the third option, starting with a packaged theme works great in most cases. The beauty above all, with all wordpress themes is that you’re able to update your website/blog yourself, without any coding experience required. Woothemes – provide numerous packages on blog templates, ideal for news publication. 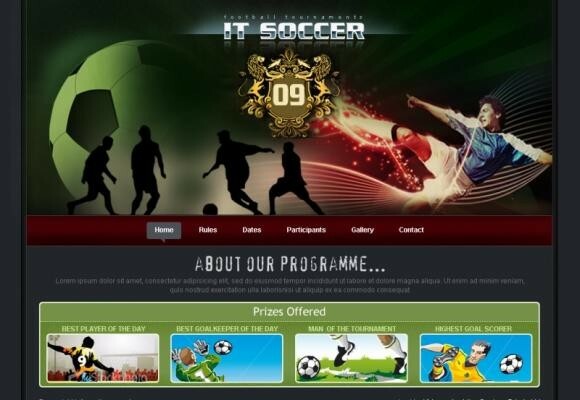 http://iteam.ithemes.com/ – ideal for soccer website. iContact allows businesses, non-profit organizations, and associations to easily create, publish, and track email newsletters. You need to capture your website visitors, by getting them to sign-up to your newsletter. This newsletter will be a reminder for them to visit your website again. Each time you update your website/blog, you’ll like your readers to know of your new content. Therefore sending them a newsletter/email about what’s new on your website is recommended to keep them coming back to your website. I recommend iContact for growing your mailing list and sending your newsletters. Elance providers a marketplace where you’re able to post projects according to your need, where freelancers from around the world then bid. This allows you to view their skills profile and feedback from previous work done. Their bids will also have rates according to your brief and you then award the project to your preferred bidder.